I just made a couple of small updates to matchNodes (1, 2). I wrote this function primarily to be called internally by fastAnc, for which it works just fine, but I've since been frustrated when trying to use it in any task for which it wasn't originally purposed. More specifically, the function is designed to match nodes between trees that are identical (to some measure of numerical precision) in species, topology, and possibly branch lengths (depending on method). When I tried to use it to match nodes across trees that were identical in core structure, but had different tips added, the function broke down. The new version should (hopefully) fix this problem. Now, if trees 1 & 2 contains taxa A, B, ..., N, but tree 1 also contains taxa Q, R, S, while tree 2 contains extra taxa T, U, V, the function (using method="distances") should be able to overcome this difference and match corresponding nodes across trees. Inspection of these matrices, and the original trees, should show that matchNodes(a,b,"distances") gives the nodes of b (in column 2) that match each node in a; whereas matchNodes(b,a,"distances") gives the reverse. The updated function is here, but it is also in a new minor release of phytools (phytools 0.2-23), along with the new function countSimmap. So, I take it that this matches nodes based on their tip-to-node distance? An alternative I've used is to use prop.part to get the descendant tips of each node, drop any taxa not shared in common and match nodes that way. 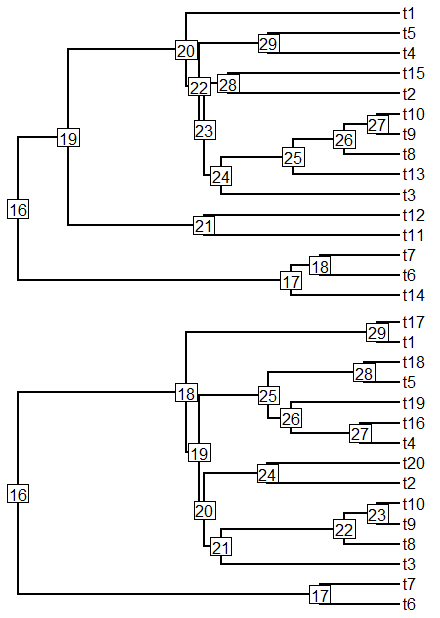 Of course, this leads to its own issues, with many-to-one matching of nodes when node (A,B) matches both nodes (A,B) and (A,B,D) in the second tree, when taxon D is not held in common. Yes, based on the set of distances from each node to all tips. Another method in matchNodes is method="descendants" and that uses the set of descendant tips of each node to match nodes across trees. This requires an exact match at present, although it could easily be modified to relax this.